An often overlooked but crucial aspect of eating the HumanaNatura way and following HumanaNatura’s OurPlate healthy eating guidelines are the important ecological advantages this approach has over other forms of modern eating, including many alternative or natural health dietary models. Recently, I explored this idea in a Natural Truth post on NaturaLife, Vegetarian Ecology, and want to reprise this essential nutritional discussion here, retitled and modified slightly for a broader audience. In the end, and unsurprisingly once considered, the modern but highly naturalized or forager-oriented HumanaNatura approach proves potentially far more sustainable across the earth’s various ecosystems than other forms of contemporary eating. It does this by avoiding soil-degrading annual staple foods grown in unnatural monoculture formats, and instead promotes natural perennial food systems that are readily made fully sustainable. These perennial food systems include free-ranged and attentively managed animal foods (meats, dairy, poultry, eggs, and fish), as well as sustainable fruit and nut-tree agriculture. And while HumanaNatura’s encouragement of diets rich in greens involves considerable annual plant food consumption, soil loss from this large-in-volume but low-in-calories aspect of the OurPlate model is easily offset via food waste composting and use as a lost soil replacement, even with just a portion of the other parts of the HumanaNatura diet. If this topic interests you, what follows is a fairly straightforward and practical way of thinking about the complex phenomena that are the ecological impacts of our modern food production systems. Notably, I will largely leave aside questions of the personal health effects of these systems and the modern diets that rely on them, but you can explore this topic via a companion Natural Truth post, Green Over Red Diets. To begin our discussion, I would point out that the ecological health effects of various human diets is an enormously complex topic, and an open scientific question today. As this recent science press article and underlying research paper highlight, the ecological impact of our dominant food systems is not an area of settled science, and there are many competing claims and counterclaims regarding the planetary effects of human eating and our corresponding systems of food production. Part of this impasse owes to the high number of variables and conditions that must be considered when calculating the effects of our eating patterns on the planet’s ecology. Part of it stems from the fact that food system effects vary by ecosystem, by the types of technologies and agricultural practices used, and by the volume of food people eat on average (which can be influenced by cultural norms, technology, and even the composition of our diets). To improve our understanding in the face of this complexity, researchers must make simplifying assumptions and limit the scope of their considerations. And it is in these simplifications that divergence begins, both directly in empirical findings and indirectly, as research findings are interpreted and used to advance or support various viewpoints. Still, a fair reading and summation of available science assessing the ecological impacts of our primary food systems is possible, which I will attempt to provide in this discussion. As you will see, this effort leads to an outlook that is far more tentative, nuanced, and qualified than we often see in both the popular and scientific press. To examine the ecological impact of various modern human diets and their enabling food systems, I will make several simplifications of my own – in the form of a three-part food ecology model. This model will chart the ecological impacts of various food production methods on differing ecosystems. The specific components and sub-parts of the model are listed below. As you can see, this fairly short list of variables or considerations is a significant simplification of the complex factors and impacts that occur across our earth’s many ecosystems from our varying diets and methods of food production. Some important ecological factors – such as human impacts on large-scale biodiversity or downstream effects from food-enabled industry and economics – have been omitted, though some will be touched on during our discussion. In addition, other factors have been assigned to broad categories, inevitably leading to the blurring and omission of noteworthy points. In all cases, however, I believe that including additional factors in my model is likely to only add complexity to our discussion, without altering its eventual conclusions. As you will see, the model’s three major components and 17 sub-factors cover and can guide a careful discussion of essential ecological considerations in human diets and food production. Overall, the model is accessible and yet reasonably encompassing, and allows for a fairly holistic and precise set of conclusions – and ones often missing from popular and press discussions of modern dietary choices and their ecological impacts. My three-part food ecology model begins with key ecological effects from human food production. In the model, I focus on four impacts: 1) greenhouse gases, 2) soil integrity, 3) water use, and 4) wastes. > Greenhouse gases are those linked to human-induced climate change, and notably include methane, carbon dioxide, and nitrous oxide (see Wikipedia Greenhouse Gas). In food production, key sources of these gasses include animals and animal waste, fertilizers, carbon-releasing devegetation and soil impairment, and emissions from food harvesting and transportation equipment. > Soil integrity refers to the health or vitality of soils and their ability to sustainably produce food (see Wikipedia Soil). As you may know, soil is distinct from dirt in that it contains rich biological systems essential to robust plant and animal life above the ground. Crucially, natural soil biology can be impaired by: a) loss of plant cover, b) loss of plant diversity, c) inadequate recycling of natural animal wastes, d) use of pesticides, e) aeration of soils via tillage, f) exposure to sun, g) compaction, and h) wind and water erosion – all frequent features of traditional agriculture and notably the production of annual staple crops (grains, beans or legumes, and starches). In fact, and as my chart above suggests, traditional annual agriculture is the primary cause of global soil loss and degradation, and today threatens much of the world’s food supply (see Running Out Of Soil and Wikipedia Soil Erosion). > Water use is of course just that, and can be enabled via direct rainfall, irrigation using captured rainfall or snowmelt, groundwater pumping and springs, and ocean desalinization. There are a number of complex issues related to water use in food production – including its impact on soil salinity, pH, and erosion – but for our discussion, I will focus primarily on whether water use is sustainable or unsustainable over time. > Wastes in food production include animal and plant materials not consumed or otherwise used in some way before or after harvesting, and other materials released into the environment during food production, transportation, and consumption. Importantly, this definition excludes materials that are reused or recycled in some way – such as when animal excrement and inedible plant materials are composted or converted to fuel – and our focus will include the potential for 100% recycling, and thus elimination, of food-related wastes. The second part of my food ecology model involves the specific food systems that are used in modern human food production. In the model, I consider six general types of food systems: 1) free-ranged or hunted animals, 2) grain & bean-fed (staple-fed) animals, 3) hybrid-fed animals, 4) human staple crops, 5) human vegetable crops, and 6) fruit & nut trees. There are of course other food production systems, but these categories capture the vast majority of cases. > Free-ranged or hunted animals are land, water, and airborne animals used for food, including their eggs and dairy products. Importantly, all such animals have a natural diet – for example, grassland plants in the case of ruminants – that not only the animal is naturally evolved for and normally achieves optimal health through, but also that typically is ecologically healthy – sustainable and synergistic – in the animal’s natural ecosystem(s) as well. While all animals produce the greenhouse gases methane and carbon dioxide, sustainably free-ranged or hunted food animals, processed and transported via carbon-neutral technology, will do so at natural emission levels (ones no higher than would occur in the absence of human interaction in the ecosystem) – as will be the case with waste generation generally. Supplemental water is often provided in these systems to improve animal health, but this can be done at levels that are sustainable (regularizing, rather than increasing annual water use). In general, as long as animal overpopulation and overfeeding are prevented – notably including overgrazing or unnatural patterns of grazing on grasslands – this natural form of food production can be readily made fully sustainable and even highly beneficial in a variety of ecosystems (see Wikipedia Ecosystem, Nutrient Cycle, and Nitrogen Cycle). > Grain & bean-fed animals are the above animals, but raised on modern artificial diets composed principally of grains, legumes, and other annual staple crops, normally grown at scale in unnatural monoculture formats, with high fertilizer and pesticide use, all to maximize short-term food yields (see Wikipedia Agriculture). Owing to the unnatural and carbohydrate-rich make-up of these animal diets, they typically lead to lower quality animal health and human food – for example containing higher fat levels and reduced vitamins and minerals – than is typical with naturally raised or hunted animals. In addition, methane and nitrous oxide levels, and waste production and water use generally, are often significantly increased relative to natural levels, and notably with wastes highly concentrated in small areas that prevent natural recycling. But far more importantly in a discussion of the ecological impact of modern diets, the production of grains, legumes, and other annual staples for animal feeds is highly destructive to soil integrity in all but the most fertile of ecosystems and using the most careful agricultural practices. These practices include diverse and restorative cover crops, no-till planting methods, and rotational grazing (see Wikipedia Cover Crop, No-till Farming, and Sustainable Agriculture, and USDA Land Degradation and Soil Health). Because of this, annual staple crop production, both for animal feeds and human consumption, is a leading cause of soil loss and degradation, and today threatens vast areas of the world’s fertile lands, along with the societies that rely on these areas for food. > Hybrid-fed animals are the above animals raised and fed with a mix of natural and artificial methods. An example is the initial free-ranging of cattle, followed by several months of finishing on grain and legume-rich diets to increase the animal’s weight and fat content. In general, the animal health and ecological effects of hybrid animal food systems are proportionate to their relative mix of natural and artificial methods. > Human staple crops also include annual grains, beans, starches, and related high calorie-plants – all typically grown at scale, in monoculture formats, and with high fertilizer and pesticide use – but in this case for direct consumption by people, rather than as animal feeds. While these forms of food production are much more efficient and less water intensive than producing food animals with staple plants (since more than 90% of animal feeds are naturally used for animal energy and metabolism) and thus produce much less methane, carbon dioxide, and nitrous oxide per person, many of the negative aspects of using annual staples for animal feeds apply in their direct use as human foods. The approach produces human diets that are unnatural, carbohydrate and allergan-rich, and fat, vitamin, and mineral poor relative to our natural (forager) foods, and result in lower levels of human nutrition overall. Unless periodic animal foraging is used, these systems also recycle unused plant materials less effectively, produce greater plant oxidation and waste, and reduce natural carbon and nitrogen recycling. And once again, and critically, the use of annual grains and legumes grown in unnatural monoculture systems is enormously destructive to soil integrity and a leading cause of global soil degradation, in all but the most fertile of ecosystems and, even then, only by using the most careful agricultural practices. > Human vegetable crops are generally low-calorie, but fiber, vitamin, mineral, and antioxidant-rich plants grown or gathered to supplement the calorie-dense animal or staple plant foods in our diets. Since these plant foods are typically annuals, grown at scale and in a monoculture format, reliant on fertilizers and pesticides, and processed and transported using carbon gas producing methods, they are a source of both soil degradation and greenhouse gasses today, despite their natural use and sequestration (storage in soil) of carbon. Vegetable crops are also fairly water-intensive, and require special conservation measures in dry climates to ensure sustainable water-use. However, unlike staple crop production overall, vegetable crops are generally quite amenable to smaller-scale, localized, and polycultural or guild plant systems, along with organic fertilization, natural pest control, and other soil-preserving cultivation techniques – all reducing the ecological impact of vegetable crop production. In particular, soil impairment from vegetable crops normally can be readily offset via conversion of a portion of our overall human food wastes into soil-restoring and loss-offsetting composts for vegetable-producing areas. > Fruit & nut trees are perennial trees that bear edible fruits and nuts. They can be fed to food animals or, once again more efficiently, directly to people. As perennial plants, soil disruption and impairment is normally low or absent, and this food system is easily made fully sustainable in a variety of ecosystems. Water use with food trees is often high, however, making them less desirable or requiring added water-saving techniques to make them a sustainable food source in drier climates. And while these systems use and sequester carbon dioxide, greenhouse gasses are typically produced in the processing and transportation of these foods today, unless carbon-neutral processing and transportation methods is used. But as with vegetable crops, localized, polycultural, and natural approaches and methods are easily employed, reducing negative ecological impacts. In addition, both production and food waste are often minimal, with unused plant materials readily compostable on or off-site, or recycled as animals feeds to both produce food and enhance soils. The third part of my food ecology model involves the ecosystem types where our various food production systems are employed. In the model, I consider seven overarching types of ecosystems: 1) fertile valleys, 2) tropical forests, 3) temperate forests, 4) uplands, 5) grasslands, 6) deserts, and 7) oceans & waterways (see Wikipedia Ecosystem and Biome for background and further reading). There are of course other types of ecosystems, such as alpine and polar regions, but these generally are not principal venues for human food production. > Fertile valleys include relatively flat, temperate to semi-tropical areas with rich loamy soils and abundant water supplies, whether via rainfall or regular flooding. As suggested in our discussion, most forms of food production can occur here sustainably, though special care is needed to mitigate the harmful soil effects of annual monoculture agriculture – especially staple crop farming. In addition, steps are required to offset elevated greenhouse gases and manage concentrated wastes from grain and bean-fed animals husbandry, if food production is to be fully sustainable. > Tropical Forests include naturally tree-dominated areas in warm and wet climates. Because of their generally fragile soils – owing to continual leaching from rainfall and the rapid natural metabolization of soil materials in warm climates – use of perennial food systems is normally essential to sustainable food production, including food foresting, free-ranging, and (though biodiversity-limiting) conversion to grasslands in flat or gently-inclined areas. Critically, annual staple crops and animal foods reliant on them often quickly undermine soil integrity and are generally not sustainable in these ecosystems, without substantial fallowing and soil regeneration practices (see Tropical Soils). > Temperate Forests are tree dominated areas in cooler and relatively wet climates. Soils are generally more substantial and less fragile than in tropical conditions – owing to reduced soil leaching, highly granular glacial soils, and slower soil metabolism – allowing more varying sustainable food production systems.Similar to tropical settings, these include food foresting, free-ranging, and conversion to grasslands in flat and gently to moderately inclined areas. Annual staple crops, grown for people or as animals feeds, will often steadily undermine soil integrity and are generally not sustainable, unless substantial fallowing and soil regeneration efforts are used (see Temperate Forests). > Uplands occur throughout the world, and in both tropical and temperate climates. They are marked by steep slopes and/or high altitudes, and are subject to proportionately higher rates of soil erosion as a result, even with natural vegetative covers. Vegetation can include tree, bush, and grass dominated areas. Because of their precarious soils, sustainable food production is generally limited to free-range herding and hunting, tree-based agriculture, and small-scale vegetable crops. > Grasslands span a significant portion of the world’s land mass, and include areas of the earth that are now substantially desertified due to the effects of past annual agriculture practices and overgrazing. Grasslands are generally flat to moderately sloped regions, with lower and often sporadic rainfall that limits forest growth (see Grasslands). Importantly, grasslands are highly dependent on grazing animals, with whom they are naturally co-evolved and form one of the earth’s largest natural nutrient cycles. Without grazing animals, grasslands naturally choke themselves with uneaten and oxidizing plant material. When this occurs, they become subject to inadequate nitrogen and microbial cycling in their soils, as well as reduced soil protection and water retention, leading to soil degradation and erosion, and the collapse of grasslands into ecologically less fertile bushlands or deserts. Owing to the low and sporadic rainfall, and dry and precarious soils, in many grasslands, annual staple agriculture in grasslands is generally not sustainable without added and sustainably managed water resources, along with aggressive soil health assurance practices. > Deserts are often thought of as relatively lifeless places and unsuitable for food production, but there are at least two important exceptions. One is in cases of desertified natural grasslands, which can be restored (see Grassland Restoration) and used sustainably for free-range animal food production. The second exception is desert areas with a local water source, including rivers and springs. So-called oasis areas are natural candidates for tree-driven food forest systems, ones that can and ideally should include free-ranging food animals to optimize system sustainability and productivity (see Desert Food Forest). > Oceans & waterways are of course natural foods systems that, like grasslands and forests, humans foraged for millennia before modern life. As such, they can be sustainable harvested, even as they are often not, and naturally recycle wastes, provide their own water, and sequester greenhouse gasses. When staple feeds are added to the mix, via fish farms and other aquaculture operations, this natural balance is often upset, producing added waste and greenhouse gases. And of course production of cultivated grains and beans for fish feeds is generally detrimental to the surrounding lands and often unsustainable, as we have discussed. #1: High Potential – Free-ranged or hunted animals – along with foraging, these are the most natural human food systems. Unsurprisingly, they can be operated sustainably and even beneficially in all of the ecosystems we have discussed, with only fairly simple resource management rules to prevent overgrazing or over-predation. Notably, reservoirs and groundwater can be used in climates that are dry or have sporadic rain to water animals and increase food yields, and this can be done sustainably as long as water use is on average offset by recharging from seasonal rain and snow. As discussed, this form of food production will be a source of greenhouse gasses, but at levels comparable to natural conditions and especially if renewable processing and transportation systems are used. If you would like to see examples of this form of sustainable, permanent, or Permaculture food production in practice in several grassland settings, see Carbon Cowboys. #2: Low Potential – Grain & bean-fed animals – this newer, post-agricultural approach to animal food production is of course in widespread use today. While enormously productive on a quantitative basis, it suffers a number of drawbacks. It produces less healthy animals and food than in natural conditions. It elevates greenhouse gas emissions above natural levels, even with renewable energy use. The artificial feeding of animals increases and concentrates wastes, making their natural and beneficial recycling in the environment more difficult. It increases water use relative to natural approaches. And it requires significant mitigation measures to offset soil degradation from annual monoculture feed production, even in the most favorable ecosystems, if this food production approach is to be made sustainable and not lead to steady soil impairment and loss over time. In many ecosystems, it is patently unsustainable, and can undermine soil ecology in a matter of years. As discussed, hybrid animal feeding represents a middle case between fully free-ranged and fully artificially fed systems. #3: Variable Potential – Human staple crops – while roughly ten time more efficient on a per-calorie basis than food systems based on animals fed with grains, beans, and other staple crops, this approach suffers many of its shortcomings, if on a smaller scale. Methane, carbon dioxide, and other greenhouse gases are significantly reduced relative to staple-fed animal production. But the approach produces a less healthy human diet than is possible, notably with excessive carbohydrates and allergens, and inadequate natural fats. At least as importantly, it also requires significant mitigation measures to offset soil degradation and loss from annual monoculture food production. Likewise, in many ecosystems, the approach is patently unsustainable, and will quickly undermine soil health and steadily erode away soil levels. #4: High Potential – Human vegetable crops – this modern substitute for our natural foraging of low-calorie but fiber, vitamin, mineral, and antioxidant-rich plants also leads to soil impairment in most ecosystems, but at a level that is more easily mitigated and remediated than is typical in the case of staple plant production. Water use is high on a caloric basis, but can be made sustainable in many settings through conservation techniques. As mentioned, annual vegetable crop production can be made fully sustainable via reduced-scale and localized farming, use of composts made from a portion of our overall food waste stream, guild or synergistic planting, and renewable energy use in processing and transportation. #5: High Potential – Fruit & nut trees – as with free-ranged and hunted animals, these perennial food systems are easily made fully sustainable in most ecosystems, primarily requiring composting and on-site animal use of plant wastes, and use of renewable energy in processing and transportation. Water use is high overall, making them less desirable or requiring added water conservation techniques in dry ecosystems. I’ve captured many of these ranging ideas in the following summary chart. I hope our extended discussion of natural food ecology has been interesting and useful to you. I also hope it will encourage you to think more concretely about the food production systems that support the ways you eat today – and how your diet can become not only personally healthier, but also ecologically healthier too. As you can see from our discussion, many forms of eating today are not just currently unsustainable ecologically, they also depend on food production methods that are inherently unnatural and difficult to make fully sustainable in most of the earth’s major ecosystems. Importantly, this includes mainstream eating patterns based on traditional staple agriculture, as well as grain and bean-rich – and thus monocrop farm dependent and soil-degrading – vegetarian and vegan diets. In all cases, these diets and their enabling food production methods are difficult to practice sustainably and at scale in the earth’s largest ecosystems – notably its forests and grasslands. And though ultimately unsustainable at scale due to these negative soil effects, I would add that vegetarian eating is more efficient than diets with high amounts of grain & bean-fed animal foods, and thus preferable ecologically (that is, less unsustainable) than diets high in staple-fed animal foods. By contrast, more natural forms of human food production, based primarily on perennial ecology and agriculture, are far superior in most regards and more easily made sustainable across the earth’s major ecosystems. For this reason, scientifically informed and renaturalized or forager-derived modern diets – such as HumanaNatura’s OurPlate healthy eating model – offer an ecologically superior diet to modern people and over time. Although these diets do rely on water-using and methane-producing animals for significant proteins and calories, by employing free-ranging and other sustainability techniques, methane levels can be held at natural levels (ones that would exist without human intervention) and water usage made fully sustainable. And this is true not just in fertile and ecologically resilient temperate valleys, but in the earth’s vast grasslands, (currently) desertified grasslands, and forests, which constitute the majority of our planet’s cultivable landmass. Overall, forager-derived and staple crop-avoiding diets enable food production that is quickly made fully sustainable ecologically, and even environmentally beneficial, in most of the earth’s ecosystems. With just a few humble ingredients, delicious, inviting, and extra-healthy Steam Meals can be made the HumanaNatura way and following HumanaNatura’s OurPlate healthy eating guidelines. And though HumanaNatura Steam Meals take just minutes to prepare, they reliably leave us feeling full and pleasantly satisfied for hours! Our sample Steam Meal begins with ground turkey and an equal amount of shredded and then finely chopped cabbage and carrots, which are mixed together and formed into ~3cm (1in) meatballs by hand. In our steaming pan, a base is built of diced carrots, parsnips, white squash, shallot or onion, and garlic, along with cut asparagus, and on top of which the meatballs are placed. This base of veggies and protein are then steamed for about four minutes (we suggest using slightly less water than usual when steaming ground meats, since they are apt to release considerable amounts of water during cooking). When the base and protein are nearly cooked, we add a generous handful of shredded cabbage and carrot, and a bit of sliced red bell pepper. The meal is steamed for an additional two minutes, with a small handful of chopped cilantro added near the end, and it is then allowed to sit off-heat for an additional two minutes. 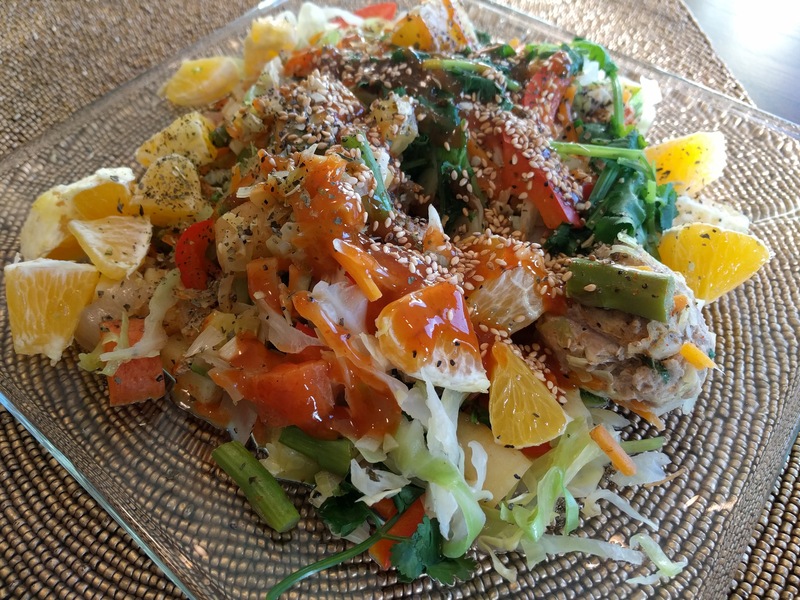 The meal is then plated and served promptly, after being garnished with splashes of soy sauce and sesame oil, a bit of black pepper, a scattering of sesame seeds, a handful of cut orange pieces, and a zigzag of chilli sauce. A terrific mix of healthy foods and flavors, sure to leave you wishing for more! Greetings from HumanaNatura at the cross-quarter! In the natural year, we are now halfway between the more extreme time of the recent solstice and the more balanced period of the coming equinox. Everywhere on earth, there is early but unmistakable change – away from the depth of winter and height of summer in each hemisphere – an ongoing feature of life on earth that touches and can inform us all. In the HumanaNatura natural health system, and as explained in our Mastering The Natural Year graphic and post, we encourage extra progress on our Natural Life Plans around each cross-quarter. At the equinox-nearing cross-quarter, this is so we have adequate completed actions and learning at the equinox– in another six weeks or eighth of a year – when HumanaNatura encourages reflection and updating of our plans.